All Sunshine wanted to do was go out to the lake and sit by her family's old cabin to clear her head of the craziness of her life. She never imagined that it would be dangerous, or that she would be kidnapped by a gang of vampires. But instead of being killed right away, she is kept prisoner in a crumbling mansion alongside the vampire Constantine. All her life, she'd been told that vampires are evil and cruel, and no human can escape them, but Constantine is unlike any vampire she has met, and has other motives. In their time spent captive, they form a tentative, tenuous bond that may lead them to find a way to save each other, and in doing so, awaken a part of Sunshine she herself had forgotten, and maybe even change the world. 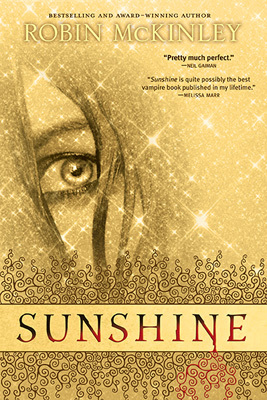 Sunshine is quite unlike any vampire novel on shelves right now. Highly imaginative, Robin McKinley has created a fascinating world that is at once so foreign and familiar to our own, and is vivid, magical, frightening, gritty, and above all, wonderfully realistic. Sunshine herself is quite an engaging main character--she's smart, funny, inquisitive, sometimes scared, down to earth, and she loves what she does. Her emotions are so well described as she goes through her tumultuous and draining ordeal, and even in her darkest moments, her independence and spirit shine through. Constantine is a very intriguing vampire as well, and McKinley described him very well, emphasizing how foreign he is to Sunshine and the human world, making him all the more intriguing and frightening. There is so much more than meets the eye in this layered story, and just when you think you know Sunshine and her world, McKinley springs more fabulous details on you, making the novel even more complicated and engrossing, until you are balancing at the edge of your seat in anticipation of the explosive conclusion. Sunshine is heart-pounding, beautiful, breathtaking, sharp, engaging, and smart. It surpasses words--you simply have to read it. Cover Comments: I like this cover a lot--quite the opposite of so many dark and shadowed covers of many vampire books! The cover has a neat texture to it, and a cool iridescent shine. It may appear simply at first glance, but if you look closer, there is a lot of neat details in it! This is a great review! I think I would have overlooked this title - but you have actually gotten me really pumped to read it! I loved reading Sunshine, but I've never seen this cover before. Very neat. I loved reading Sunshine some years back and I had to pick up this edition not only for the larger size (than the previous pocket sized paperback I used to have) but for the lovely cover. Glad you enjoyed it. Sunshine is an unforgettable novel. I like Robin McKinley, but as soon as I saw the word 'vampires,' I stopped reading. So sick of vampires. Great post! I'm a fan of this book as well!